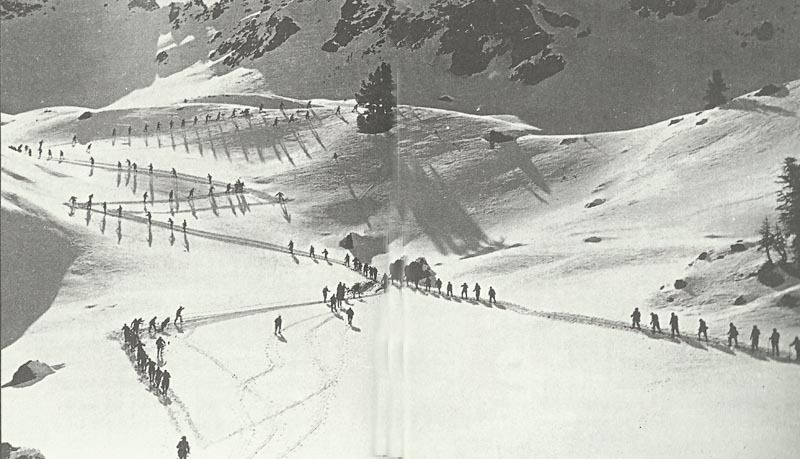 Italian Alpini mountain troops trek through the Dolomites. Dolomites: Italian 17th Division captures Cima Layazuoi and secures Cima Falzarego. Champagne: German gas attack east of Reims. Hindenburg’s HQ moves from Lötzen to Kovno. Galicia: ­Russian general Ivanov takes 7,500 PoWs near Tarnopol and about the same on October 30. Gallipoli: Churchill memo urges gas helmets be sent as large German gas stocks reported (falsely) to have reached Constantinople; also urges use of gas against Muslims. Britain: Government abolishes London Declarations’s Article 57 (ship’s nationality denoted by flag). Italy: New taxes and increases for duration of war. Britain: Women bus and tram conductors permitted. (First two in Glasgow following April). South Africa: Botha wins the general election.